NASA’s Mars Reconnaissance Orbiter, which has sent home more data about Mars than all other missions combined, is also now providing data about a comet that buzzed The Red Planet today (Oct. 19). The orbiter continues operating in good health after sheltering behind Mars during the half hour when high-velocity dust particles from comet C/2013 A1 Siding Spring had the most chance of reaching the paths of Mars orbiters. It maintained radio communications with Earth throughout the comet’s closest approach, at 11:27 a.m. PDT (2:27 p.m. EDT), and the peak dust-risk period centered about 100 minutes later. Following the critical period of dust flux, the orbiter is communicating at 1.5 megabits per second with NASA’s Deep Space Network. It remained on Side A of its two redundant computers, and all subsystems are working as expected. Downlink of data has begun from today’s comet observations by three instruments on Mars Reconnaissance Orbiter. The full downlink may take days. These instruments — the High Resolution Imaging Science Experiment (HiRISE), the Compact Imaging Spectrometer for Mars (CRISM), and the Context Camera (CTX) — also observed the comet for days before the flyby and will continue to make observations of it in the next few days. The orbiter’s other three instruments are being used to study possible effects of gas and dust in the comet’s tail interacting with the atmosphere of Mars. These are the Mars Climate Sounder (MCS), the Mars Color Imager (MARCI) and the Mars Shallow Radar (SHARAD). Three NASA Mars orbiters, two Mars rovers and other assets on Earth and in space are studying comet Siding Spring. This comet is making its first visit this close to the sun from the outer solar system’s Oort Cloud, so the concerted campaign of observations may yield fresh clues to our solar system’s earliest days more than 4 billion years ago. 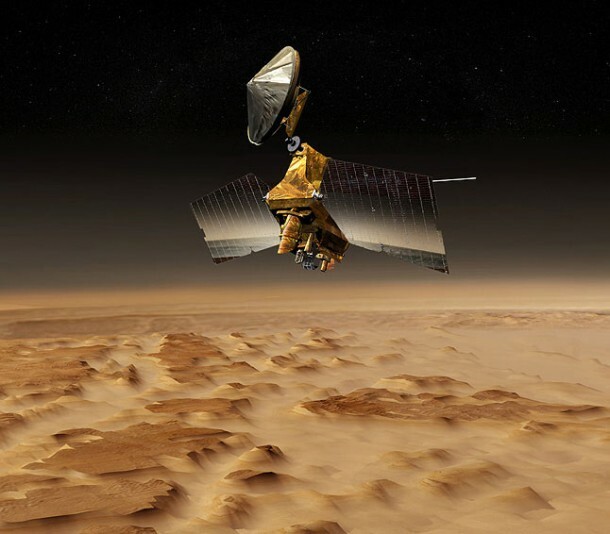 Following the comet flyby, operators of NASA’s Mars Atmosphere and Volatile EvolutioN (MAVEN) orbiter are assessing the status of that orbiter and operators for NASA’s Mars Odyssey are anticipating resumption of communications. The Mars Reconnaissance Orbiter mission met all its science goals for the two-year primary science phase ending in 2008. The spacecraft’s overtime work since then has added to the science returns. The mission has provided more than 240 trillion bits of data about Mars, a volume equivalent to three-and-a-half months of nonstop, high-definition video. The data it acquired during the comet’s closest approach to Mars are now being transmitted to Earth, but it will take many hours before downlink is complete and processing can start. Objectives of the observing program are to attempt to image the comet nucleus, to study its surrounding coma of dust and gas, and to search for signatures of that material interacting with the Mars atmosphere. Observations of the comet will continue for another day or so, as the comet and Mars separate, with the comet reaching its closest approach to the sun in about a week, on Oct. 25. JPL, a division of the California Institute of Technology, Pasadena, manages the Mars Reconnaissance Orbiter for NASA’s Science Mission Directorate, Washington. Lockheed Martin Space Systems, Denver, built the spacecraft and supports its operations. Lead organizations for the orbiters’ six science instruments are University of Arizona, Tucson, for HiRISE; Johns Hopkins University Applied Physics Laboratory, Laurel, Maryland, for CRISM; Malin Space Science Systems, San Diego, for CTX and MARCI; Sapienza University of Rome, Italy, for SHARAD; and JPL for MCS.